Once again, Topsail Insurance sponsored a series of informative talks by members as well as an overview of a challenging insurance market. By lunch on Saturday, our numbers had grown to 80 and we had good attendance at the morning lectures. Beth Bushnell, s/v 'Splinters Apprentice', gave an account of Beth and Bone's slow meander around the world twice without completing a circumnavigation while Sally Currin, s/v 'Shimshal' gave a fascinating talk about Sally and Simon's time in Greenland, with stunning photographs and amusing anecdotes. 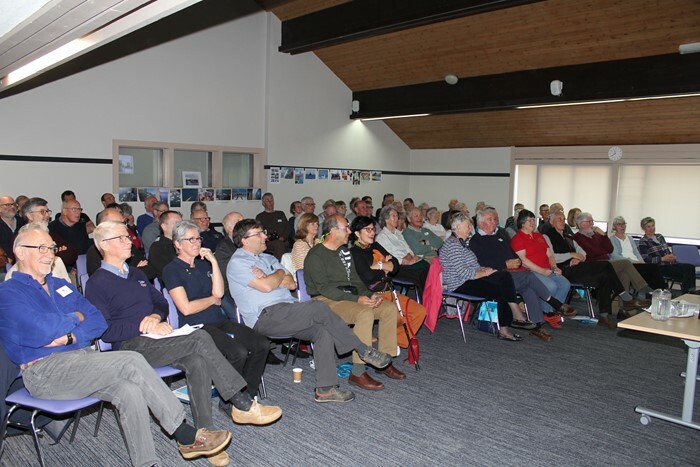 Daria and Alex Blackwell, s/v 'Aleria' gave a helpful overview of cruising and overwintering in the Rias of Galicia in Spain, making the case for spending time in the rias rather than just stopping en route to the Med or the Caribbean. On the practical side, Simon Currin provided in depth instructions on navigating the website while Joe Jollands introduced the new mobile app, soon to be launched for beta testing by members. Bill Balme rounded out the morning by discussing the details of the upcoming Celtic Cruise with interested members. A gallery of photos will be posted on the OCC website.